Oh man am I fired up about Ragged Top. I've had my eyes on this one for a while. Ragged Top is a very distinctive range/peak in the northern part of Ironwood National Monument. There are no trails here at this time so this hike is a short but tough scramble and bushwack through pristine desert, then up a gulley of your choice for simply wicked scenery. If you are lucky you may be accompanied by a desert bighorn along the way (I was not...bummer). As you face the northern aspect of the Ragged Top you will notice there are two especially prominent gulleys facing pretty much due north. There's a steeper one just west of the main summit and a second, somewhat less steep one west/right of the first. I'll call this second one the Northwest Gulley. I chose this one because it ascends two saddles, then wraps around to the southwest side of the peak, where you are basically enclosed 270 degrees + by canyon and peaks that all the pictures in the world would never do justice and also because I have a mild hamstring injury (should probably be resting that). The first steeper canyon is the route to the summit of Ragged Top, which is for another day. Alright, the first part is basically an easy desert scramble straight towards the huge gulley just west of the summit. I headed for this one and then accessed the northwest gulley from here, they seem to start as one. Nothing fancy here, I just did my best Terminator impression in a straight line for the canyon. The desert you pass through is just perfect. You'll notice a wash winding around that ultimately leads up into base of the mountain and canyon. It is roughly 1.25 miles to this point. You will gradually begin climbing now and the canyon is wide. You can see where it splits with a shelf of ground inbetween. Basically just start angling to your right towards the northwest gulley, which is essentially always visible. You will see the first saddle, and aim towards it. There is no trail, but occasionally I seemed to stumble upon what appeared to be a very faint game trail. If it works for them, it works for me. A note to remember is that the footing is occasionally loose, so be careful; poles or a sturdy stick may be useful for this hike. 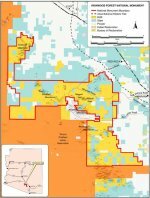 As you attain the first saddle you will realize that the range opens up towards the south via a couple of more canyons, and your views to the north (including Picacho) are great. You will also see the second saddle up and to your left, southeast of where you stand. Angle along the left canyon wall towards saddle number two, which is not very far away at all. Again, you may pick up game trails here and there, which are quite useful. The footing becomes more loose here. As you attain the second saddle things become even better. Huge spires surround you on every side. Birds soar down the southern canyon. It's pretty sweet. To your left or due east now climbs the main ridge of peaks including the summit (which would be near impossible to reach from here I think). However, you can climb up the closest peak and explore along the ridge line until vertical spires stop your progress. It requires some climbing, but nothing technical. I would recommend checking it out if you have the time. As you climb up and around, you'll find a route that works for you and ultimately dumps you on a third kind of smaller saddle. This spot is just fantastic. Peaks and the large southern canyon nearly enclose you. I hung out here for a while enjoying a really unbelievable place and celebrating my 1000th mile hiked in Arizona since moving here. There are also scattered shallow caves that I noticed everywhere, interesting and no doubt a nice hangout for something. From here head back down the way you came, or as close as can be expected. As you reach the base and start your scramble back, just go nearly due north (just a touch east of north) and you'll be back at your car soon, or at least on Silverbell which you can easily walk back. I would recommend gloves, pants, sturdy boots, plenty of water and a compass for this hike. 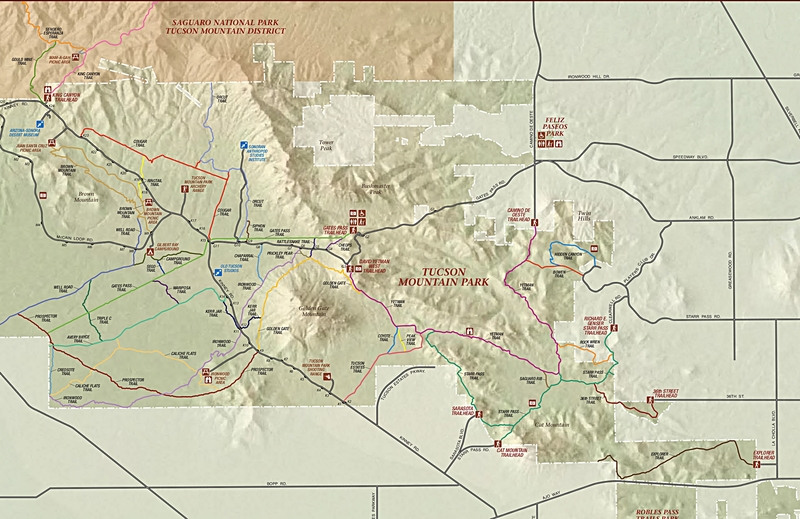 The Ironwood Forest National Monument is located 25 miles northwest of Tucson, and about one hour by highway south of Phoenix. This 129,000-acre national monument contains a significant system of cultural and historical sites covering a 5,000 year period. Possessing one of the richest stands of Ironwood trees in the Sonoran Desert, the monument also encompasses several desert mountain ranges including the Silver Bell, Waterman and Sawtooth, with desert valleys in between. Elevation ranges from 1,800 to 4,261 feet. Three areas within the monument, the Los Robles Archeological District, the Mission of Santa Ana del Chiquiburitac and the Cocoraque Butte Archeological District are listed on the National Register of Historic Places. 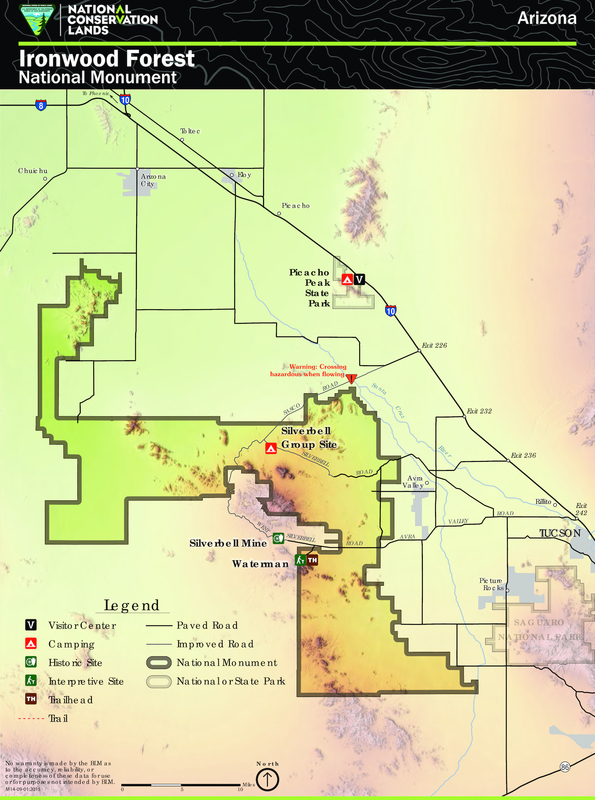 There are two main points of entry - Interstate 10 at Avra Valley Road, and Interstate 10 from the Red Rock exit, southwest on Sasco Road to Silverbell Road. 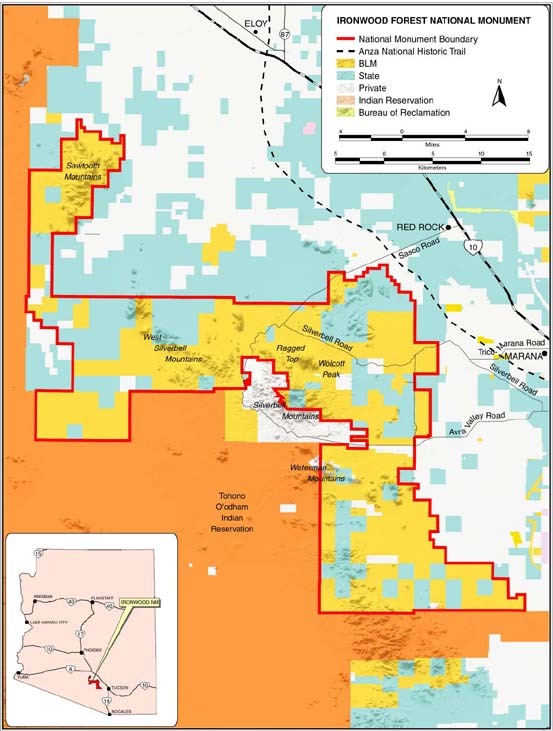 Activities that were permitted on these public lands before the designation are still permitted, except for new mining claims and geothermal leasing. Commercial activities require a permit. The BLM processes new permits for special activities mostly involving recreation, such as mountain biking events. With a stunning diversity of bird and animal life, the monument offers visitors many opportunities for viewing wildlife. A dazzling display of spring wildflowers result from abundant winter rains. There are no facilities. Camping is allowed up to 14 days. Taking your vehicle off roads or trails is prohibited. Visits to the area require special planning and awareness of such potential hazards as rugged and unmarked roads, abandoned mine shafts, poisonous reptiles and insects, extreme heat and flash floods. Visitors should bring plenty of water and gasoline, and stay on main roads. Easiest is probably from I-10. 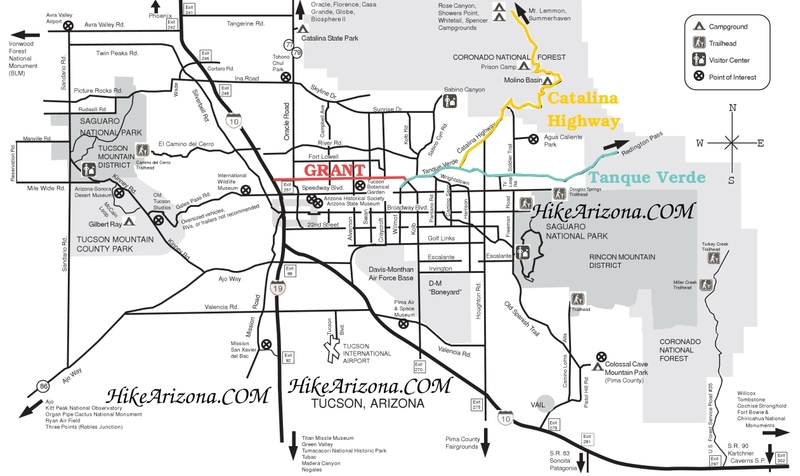 Take exit 232 and go west towards Pinal Airpark. Just before the park the road turns left and runs south as Trico Road. Follow this to Silverbell (roughly 3-4 miles) and turn right onto Silverbell. Stay on Silverbell as it runs west and north. At about 8.5 miles in it turns into a good gravel road. At roughly 12.5 miles in there is a rusted signpost on your left and a small turn in on the left. Follow this in to a circle loop and park. The north face of Ragged Top and it's two gulley are in front of you.